Award winning animated video for CSK Creative. Boat Man, The Hero Boating Safety Needs! When the US Coast Guard needed a hero to teach people about boating safety in a unique and engaging way, they turned to CSK Creative. Only they didn’t know Boat Man existed yet. 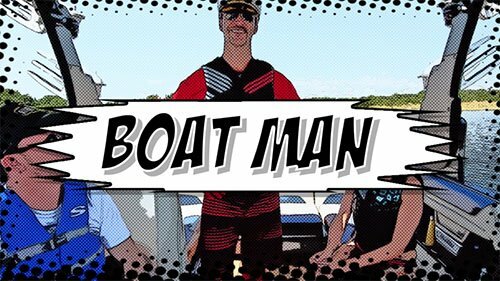 They came to us with a plea to make interesting, engaging videos that would keep people watching and learning about boating safety at the same time, so I came up with Boat Man. Now to be completely clear, Boat Man has no real super power, he just knows a lot about boating safety. That fact is the whole premise of these videos, as the boat crew is doing something wrong and Boat Man needs to correct them. I concepted, wrote, cast, shot and edited this entire campaign and the USCG was thrilled to get engaging, humorous original content. Of course, this whole thing wouldn’t have been a success without Boating Magazine and the amazing actors who brought the characters to life. Professional actor Janna Burgess played multiple female roles, professional wakeboarder Chad Sharpe lent his wakeboarding and acting abilities, Aaron Wendler was both Production Assistant and one of the fan favorite character actors and last but certainly not least, professional waterskier Todd Ristorcelli brought Boat Man to life as no one else could have. I should also mention that it was about 90 degrees with just as high of humidity so all the actors were troopers, but Boat Man especially deserves credit for battling the heat in his costume. Check out the Boat Man series below. Hope you enjoy! If you’re looking for original content please don’t hesitate to contact us.